I didn’t mean to pick up Sweet Tooth. I’d heard a lot about it, sure, but I had a lot on my plate already. I just happened to be in on the bookstore level of the building my fiancée works in and slipped it off the rack while I was waiting for her. 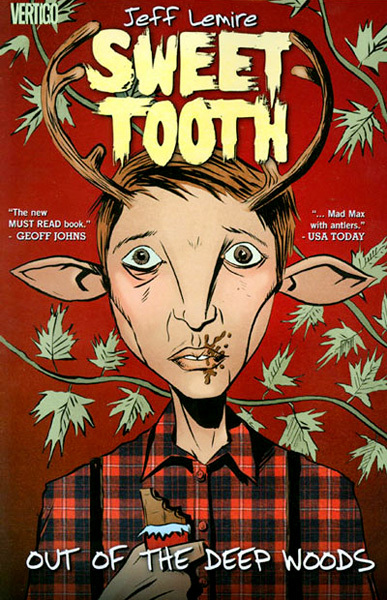 Like the tempting candy that eventually lends the main character his nickname (along with the title of the comic), Sweet Tooth is undeniably seductive. As the newest celebrated Vertigo title, in a long line of successes for that extraordinary imprint, it starts right off with the weird. 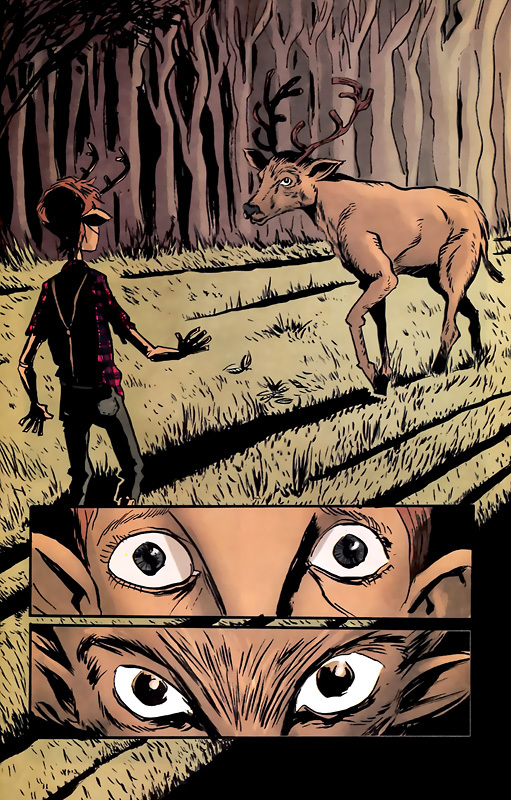 Artist/writer Jeff Lemire knows how to get pages turning and he isn’t afraid to take risks. Three sets of eyes and some feet? It’s not what you’d expect as the first page of a new ongoing, at least not if you’re used to comics-by-committee. But, accompanied by Gus’ dialogue, innocent and frightened, it’s the right first page for this book. As a nightmare, it doesn’t hint at much besides tone, but the opening sequence makes things clear without feeling at all like exposition. Gus has been living with his father alone in the woods. Something has happened, bad enough that Pa warns about lands of fire and brimstone, only sinners left, and keeps Gus close. He warns him not to go beyond the fence, teaches him to live on his own and run from the others. This “specialness” has resulted in the hybrids being hunted, hated. And Gus’ father tells him he’s the last left – and then, just 15 pages in, Pa dies. Gus is alone (and because the plot must move forward) the bad world outside soon finds him. Sweet Tooth Vol. 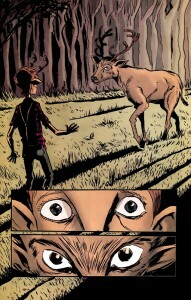 1: Out Of The Deep Woods collects the first five issues of Lemire’s new Vertigo series. 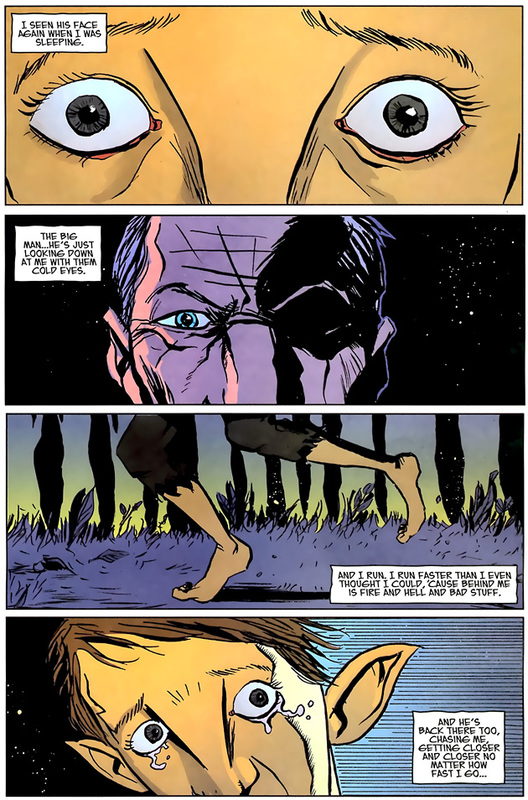 The creator is probably best known for Essex County, a small town epic now collected in one hefty volume, but he also received acclaim for his first Vertigo publication, The Nobody. Sweet Tooth is his first major ongoing series (which he started just a little over a year ago), but Lemire is now a signed DC exclusive (though his contract allows him to work on his current Top Shelf project “The Underwater Welder”). In addition to this self contained creator owned work, he is currently penning Superboy. This Smallville-centered DC property is probably a good match, since Lemire is a writer very invested in strange little towns and equally strange young men. In Sweet Tooth, this theme is distilled by the apocalyptic setting – with most of society gone, the entire world is like a small town. It’s disconnected, off the grid, populated by a few gruff characters. Gus, of course, a variety of crazies, and the other star of this first volume – Jepperd. The Big Man. 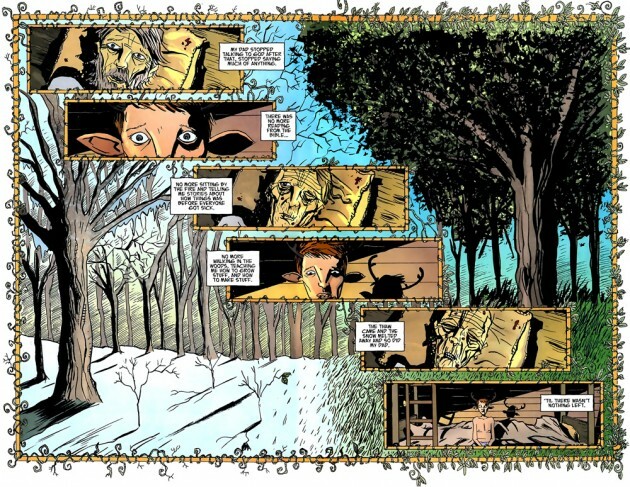 While there’s no telling what’s to come in this story, so ripe as it is for twists and turns, Out Of The Deep Woods is a fairly straightforward start. Gus is lost, new to a harsh world, and he latches on to Jepperd. As a manly figure that makes no move to hurt him, he’s the closest thing to a positive role model the boy has. But it’s not likely we’ll be seeing blurbs such as “A heartwarming tale of family bonding – when all else is lost. A boy… who needs a father. A man who never knew he needed someone to love..” This isn’t a Hallmark Channel movie, it’s a Vertigo title. The hints of paranormal, scattered profanity, and the sudden spouts of violence are exactly what we’d expect from a Vertigo title. To compound it, I found myself blowing through this volume. It was over before I knew it, without much happening that wasn’t hinted at heavily from the first issue. These problems are relatively minor and may indeed become irrelevant altogether as the series goes on – often the self contained Vertigo titles read best in a stack of trades. 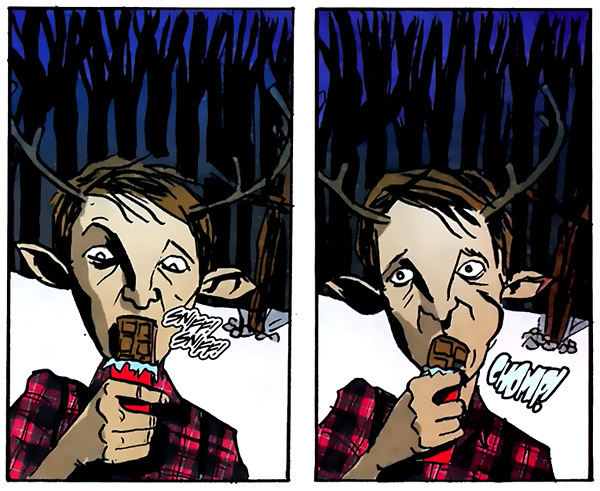 If I had discovered Sweet Tooth later in life, I could see myself sitting down with the complete run and devouring it in the course of a single afternoon. Even if the slightly predictable personae and situations persist throughout, the writing style and characterization is still a total treat. It’s not all dreariness. 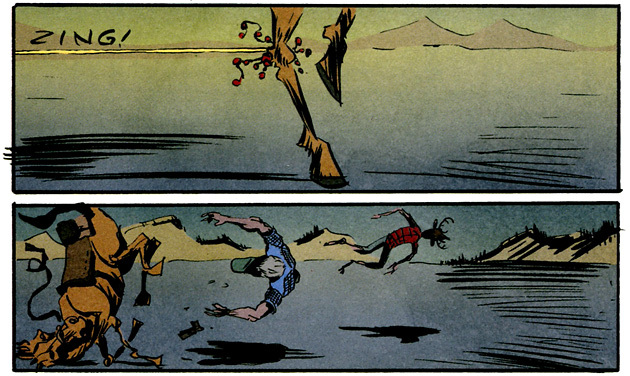 Lemire throws in the occasional bright sunset, strange dream sequence, or stylized set of imagery. A personal favorite is the amazing bordered spread of Gus considering his father wasting away while seasons change in the background – all set inside panels adorned with green-vined framing. Lemire is a comic artist with a more free-form approach to human figures and faces (and even backgrounds at times) so I can understand if his art doesn’t work for everyone. It’s odd, like the story, and (also like the story) sometimes brutal in the use of line and anatomy. Somehow this brutality leaves room for bright cartoony eyes and exaggerated emotion. Personally, I love his figures, especially their shoulders, dynamic and expressive without being over idealized forms. Lemire tends to elongate arms and emphasize the upper torso, using this to exaggerate motion, from shrugs to painful convulsions. The characters have faces hewn from rock, craggy things that posses the ability to move into forms of delight, but default to slates of prolonged pain. Faces of the world post-apocalypse. I could go on longer about this Sweet Tooth Vol. 1: Out Of The Deep Woods‘s intricacies, but I’ll save further discussion for the next volume. I have no doubt that I’ll be looking at it soon. The series is off to a great start. If you’re looking for a new monthly to pick up (with the first two trades already on the shelf) – this is one to support. With my slight reservations about the few predictable elements, the real shame would be if Sweet Tooth never gets a chance to bring its extremely intriguing set up to a satisfactory conclusion. Far too many creator owned titles end before their time is up. My real fear is that this story, which could be an epic alongside Preacher or The Walking Dead, will be cut short. Unless Vertigo makes a move towards continuing in OGN form, that means we have to support titles like this while they are in floppy – no matter how good the story is, recent cancellations have proved that the bottom line will always be a factor. Ideally, in a few years, I’ll be sitting down with a tall stack of Sweet Tooth trades, ready to experience the whole story through in one sitting. 4 out of 5. Definitely worth getting into. Even with some things you’ve seen before (and hopefully much you haven’t!) the title is amazingly irresistible. It’s executed very very well and makes for an enjoyable read. This is a self contained title and the start is here – like most self contained ongoings, you should read it through by the volume numbers. This is the first book in the series. Lemire has other works, but there’s no pre-gaming required for this one. The next book is Sweet Tooth Vol. 2: In Captivity. 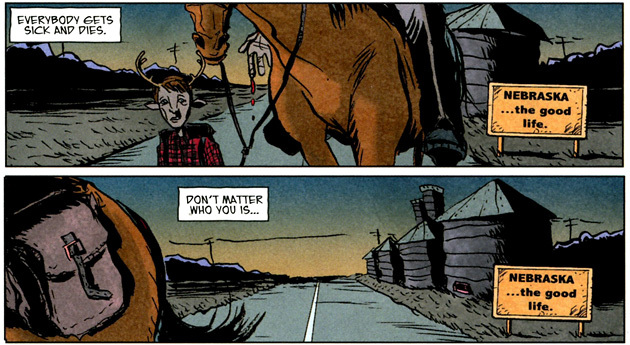 If you can’t stand the wait for the third volume and need more Lemire now, check out Essex County and The Nobody. The cover alone would make me shy away from this. Creeeeepy. It will be very interesting to see how the series progresses. I’m so inpatient about waiting for the next trade to come out after reading a ton back to back (I’m looking at you ‘Fables’) so I’ll check back in a few volumes to get a good fill. I can’t express how much I enjoy the additional recommended titles in your reviews. It’s always nice to hear about other titles. yeah, same here – I’m having the same issue with Fables. I’ve got a huge stack of those trades, now, and won’t be diving into em until the whole series is finished. Even if it takes another ten years. I’m kind of scared that it will become another unending franchise, though. It’s hard enough trying to keep up with Marvel and DC! I prefer the unending self-contained titles as you know they wont spiral out of control crossing over with a million other titles, only to have them dismissed 5 years later as non-canon. I read the preview to this series in the back of one of the single issues way back and wasn’t left impressed by it, but it’s not often those previews work well as it’s impossible to sum up a new story in 8 pages. I will have to give this a look a year or two down the line once it has a few more trades out. See the problem is that if everyone thinks it looks interesting but wants to wait, it will probably get canceled for poor sales. That’s probably what happened with Unknown Soldier. That is true but Dysart managed to write an ending for Unknown Soldier that seemed natural for the series; looking at it I think that series was better plot-wise to end rather than stretch on for too long, it might have lost it’s message. I guess the editors agreed with you. In any case, I hope Lemire gets to tell the story he’s planning on with Sweet Tooth. Yeah I hope so too, from this review it sounds like worth checking out, but I just happen to be a several volumes at a time person. Despite all the negative press directed at the editors, and all their cancellations of titles, they do tend to call the right shots often. I think I read somewhere that Y:The Last Man was only meant to be 6 issues long but instead ran to 60 issues, and we have them partially to thank for that decision. Yeah, that’s a problem too. There are SO many things that start and then are cancelled that it makes me quite cautious about getting into anything new. TV shows are the worst ones with this. Then again lack of support is probably why they get cancelled. Hard to weed out what is worth getting into and what you should avoid completely (ie. “The Cape”). yeah. When I’ve made a decision, I tend to just buy the trades and hold them to the side to read later. I’ve been doing that with Ex Machina, Powers and Fables. I am really grateful to the owner of this web page who has shared this impressive paragraph at at this time. we subscribe to. ‘ To disable the risk of high blood pressure, limit sugary drinks and desserts. sppeaking about! Bookmarked. Kindlyy additionally talk over with my site =).